Well, I made it home! Ryan and I drove back last night. It feels great to be home, but I was sad to leave what I think is a golfer’s paradise. I couldn’t have planned a better finish to my tournament, birdieing my last 2 holes to finish tied for sixth! John, again was amazing. He helped me out so much, and I wouldn’t have finished so well or played that well without him. John and Jason (his son and caddie) really did nothing but good things for me the entire week. With everything I did, I wouldn’t have been able to do it without Ryan, my chaperone, and chief strategist for the week. Without him I would not have had the best week of my life. I was with him wherever I went, and I enjoyed every second of it. He is the best caddie, best chaperone, and one of the greatest friends I could have. Thank you so much, Ryan, for everything you did for me. I also want to say thank you to Tim and Margo Daniels for taking me in as their own for the week. They spoiled me, and treated me like royalty the whole week I was there. They were absolutely amazing, and I couldn’t have wanted or asked for a better host family. I will definitely keep in touch with them. As I look back and think about my week, I can say it has been the best week of my life. 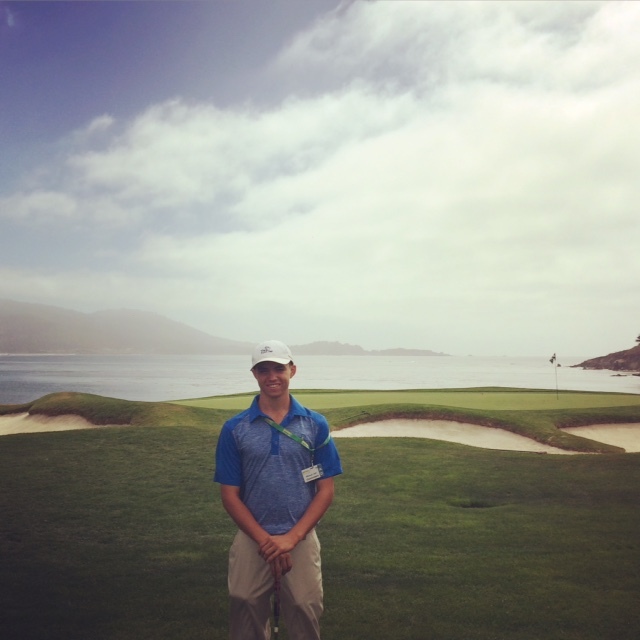 I have a career path I want to chase, and goals I want to achieve, but I will forever and always remember, The 2015 Nature Valley First Tee Open at Pebble Beach. I made the cut!!!!! I did it! 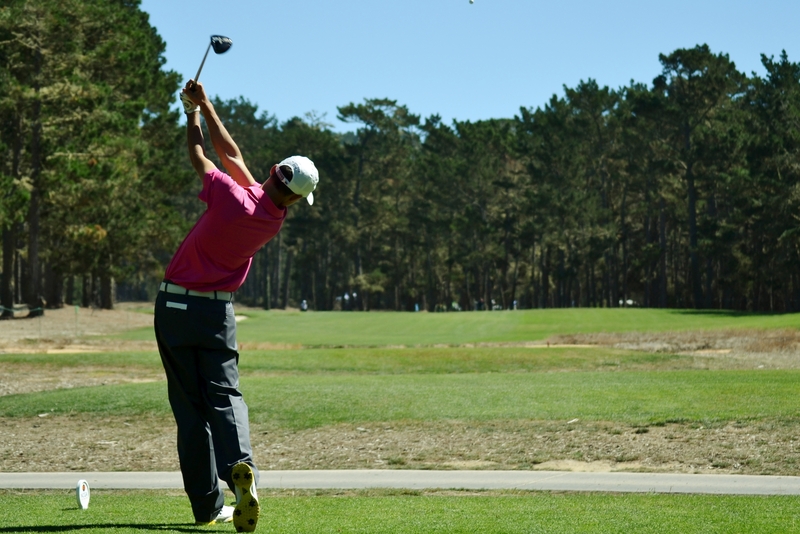 I made a goal this week to have a tee time for Sunday at Pebble Beach, and I have done exactly that! I am beyond excited and thrilled for what I have accomplished this week! John has been amazing to be with; I could not have asked for a better partner. He has helped me out so much and he’s been just great! What a thrill that first tee shot was today! Over 100 people were watching me, and I was extremely nervous, but it was a nervous that I have always wanted to feel. I strive to feel that moment and want that feeling so badly! I certainly felt it today. The kids were great. I loved signing autographs and meeting all the kids. 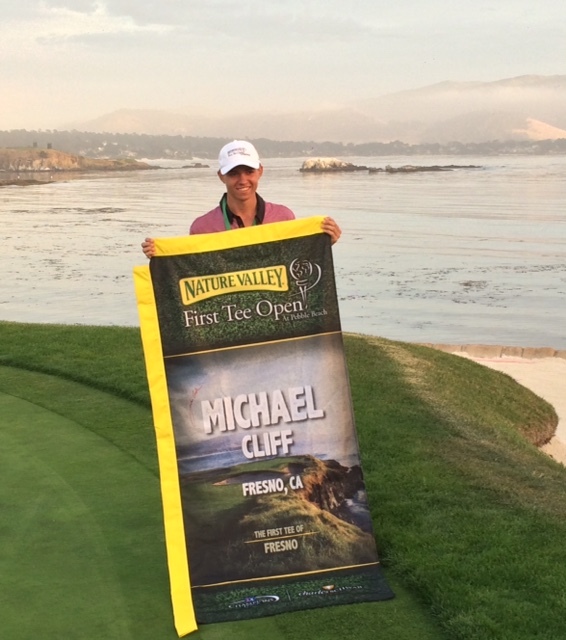 They congratulated me a lot and I loved having them at Pebble Beach. It certainly made this day that much more special! I give them, and the volunteers, a huge thanks for traveling from Fresno to support me today. I cannot imagined a better week. I am a little tired because I have been really busy with everything going on, but it has been nothing less than the best weekend of my life. Yesterday was my first time playing Poppy Hills ever! My practice round was awesome! The course is very tough with sloppy greens and lots of hills. I enjoy playing difficult courses and love the challenges they present. I hit a lot of great shots during my round, and I’ve been working on the range with Ryan to shape my shots. Moving the ball both ways will allow me to play well at Poppy because you have to shape your shots around corners and into tucked pins. If I can get comfortable working it both ways at Poppy, then I should be just fine out there! With all the excitement of playing Poppy Hills, following my round I went straight to The Terrace Lounge, where we had The Champions Dinner. They announced my name along with everyone other participants. After every name was called, it was time for dinner, which was very very good! After the dinner, Colt Ford performed for all of us! That was very very fun and very enjoyable! I don’t really listen to country music so it’s not something that impresses me, but Colt Ford did way more than impress me last night! 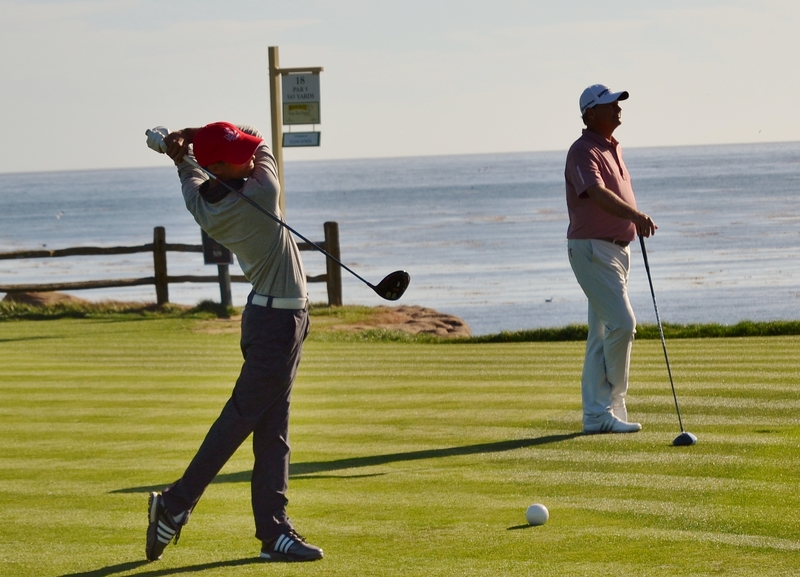 Today I will be playing Pebble Beach Golf Links at 10:10 am, and I am beyond excited for it! Mike will be snapping a lot of pictures of me, so I will be sure to post the best pictures on this website’s gallery. Check it out tonight! Yesterday was amazing, with a new course played, new people met, more great food eaten, and more memories made. We have arrived! Mike Firpo, Ryan Castanet and I arrived this morning at Pebble Beach Golf Links. First thing we did was check in, that’s where I got my schedule, shirts, and some very nice glasses! Next we went and had breakfast at the Pebble Beach Lodge. That’s where I meet Fred Funk, saw defending champion John Cook, and Olin Browne. After I finished eating my amazing breakfast, I headed out to the range to practice. The practice facility is the best I have ever practiced on; the green was quick, the range was amazing, and the chipping green was big! After my practice session, Ryan and I went exploring to kill some time, we meet up with our host family Tim and Margo Daniels. Let me tell you, their house is amazing, and their bed is the most comfortable bed I have ever slept in. After we saw the house, we quickly drove back to The Pebble Beach Practice Facility to welcome all the participants! We had skills challenges, and I met a bunch of new people from all over the country! 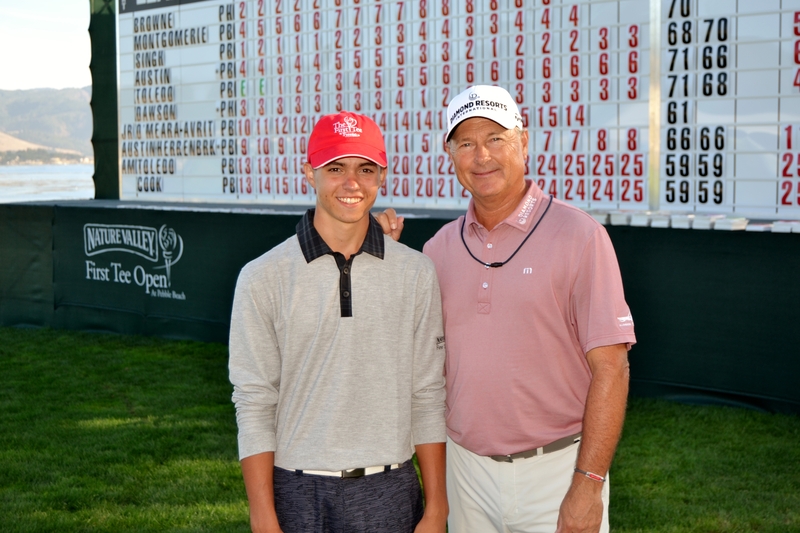 After I met new people and finished my skills challenges, it was time to meet my Champions Tour Pro for the week. I went to my bag and found the envelope that had the name of my professional. I quickly opened it and read John Cook, defending champion, and Champions Tour legend. I was super excited and stoked when I read his name. Today is my practice round at Poppy hills, it will be my first time playing this newly designed course, and again i’m very excited to see a new course! Lets hope I hit em’ straight! 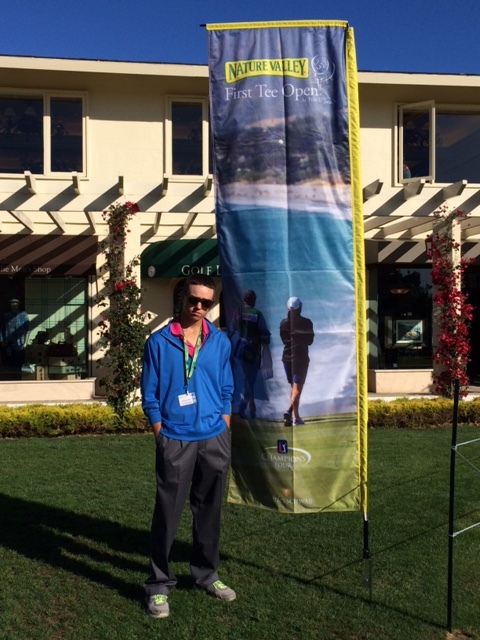 Two years ago, my brother was a participant in The Nature Valley First Tee Open at Pebble Beach. I will be interviewing him about his past experience and what he did while he was a participant there two years ago. “The pairing’s dinner was the day before the tournament started and the food there was completely amazing. Tri tip, salad, and breadsticks. Honestly though everything was good, I can’t complain at all about the food I ate,” Daniel replied when asked what his favorite meal was. Talking to Daniel about his experience only makes me more excited about my upcoming experience. It is crazy how fast time flies, it seems like only a week ago I got the call saying I was selected into the tournament. I am beyond excited about what I am about to experience and the memories that I will make that I will never forget. The holes that I am most looking forward to playing at Pebble Beach are hole numbers 7, 10, and 18. I had a dream that I made a hole in one on the seventh hole, how awesome would that be if that came true! The odds of that actually happening are slim, but having a makeable birdie putt there would make me just as happy. The tenth hole is another great hole I am excited to play. When I play my practice round at Pebble Beach, I will be sure to take a lot of pictures of the Pacific Ocean walking down that hole. The hole I am most looking forward to playing, though, is number eighteen. It is simply beautiful, and I have always pictured playing that hole in my head. It has always been my dream and my goal to play the famous Pebble Beach Golf Links, and to actually have that dream about to come true is truly amazing. 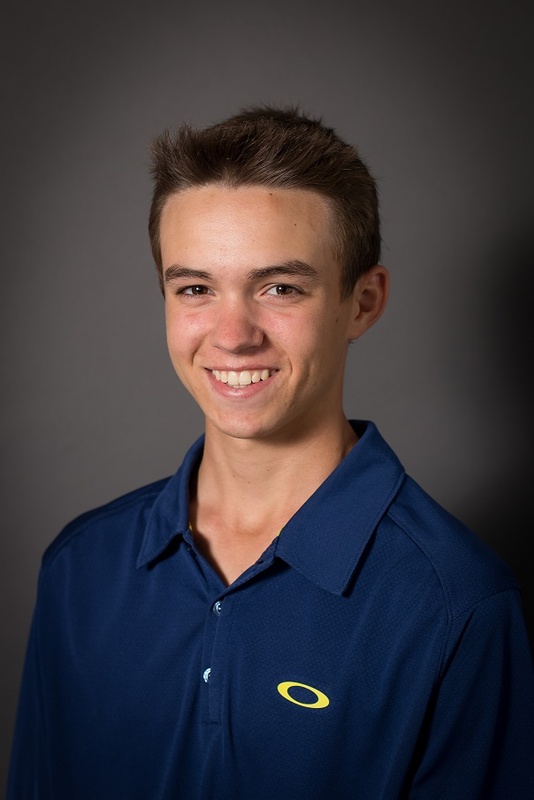 Not every junior gets the chance to play with a Champion’s Tour legend, and I am very honored that I will get to play alongside the best of the best. Playing with any Champion’s Tour player will be amazing, but there are a few that I really would love to have the opportunity to play with. One of them is Jay Haas. I would love to play with him because I have heard he is very nice, and he is also very, very good. Another is Colin Mongomerie. He is playing his best golf on the Champion’s Tour right now and again he is very nice. My last is Freddy Couples. Who doesn’t want to play with “Boom Boom”? He’s got one of the sweetest swings around, and I would love to play with him. It would be truly amazing to be standing next to one of these pros come tournament time, but it will be just as amazing to be paired with any other professional.